Preheat the oven to 350°. Squeeze the lemon half over a bowl of cold water and drop it in. Working with 1 artichoke at a time, snap off the dark green outer leaves. Cut off the top two-thirds of the leaves. Trim the stem to 1/2 inch; peel the bottom and stem. Using a teaspoon, scrape out the hairy choke. Drop the artichoke into the lemon water. Repeat with the remaining artichokes. 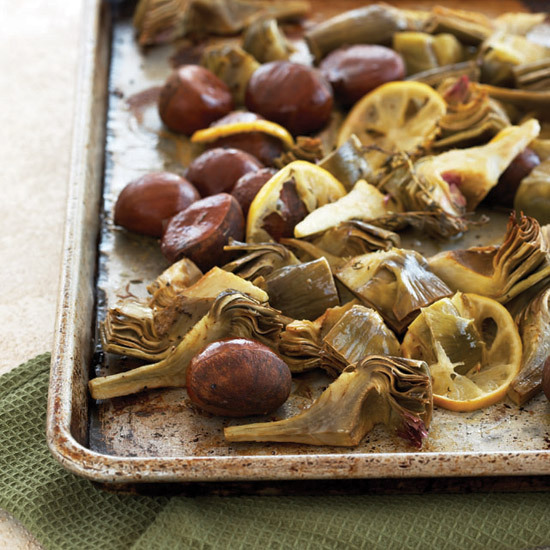 Drain the artichoke hearts and cut them into 1-inch wedges. In a roasting pan, toss the wedges with the chestnuts, garlic, lemon slices, broth, oil and thyme. Season with salt and pepper. Cover with foil and roast for 25 minutes, or until the artichokes are tender. Remove the foil and roast for 15 minutes, or until golden and the pan juices are evaporated.